I'm happy right now too. I am stressed, and will always have stress in my life...that's part of having anxieties :D But, even with all the stress I'm happy. And not drunk. But getting there. I am sleepy, but that'll wear off as I get going. We're going to see The Hunger Games followed by Catching Fire as a double feature... gonna be at the movie theater for damn near 10 hours by the time this is all said and done. Yay for being old, old people sit around and do nothing. I am starting to think that I might seriously be an insomniac. Turns out, every time I go #2, when I'm done I spit on the toilet paper before flushing. TMI, but where the hell did I pick up that habit? I happen to be eating mashed potatoes right now...and i might take a nap. I bought and decorated my own little christmas tree. 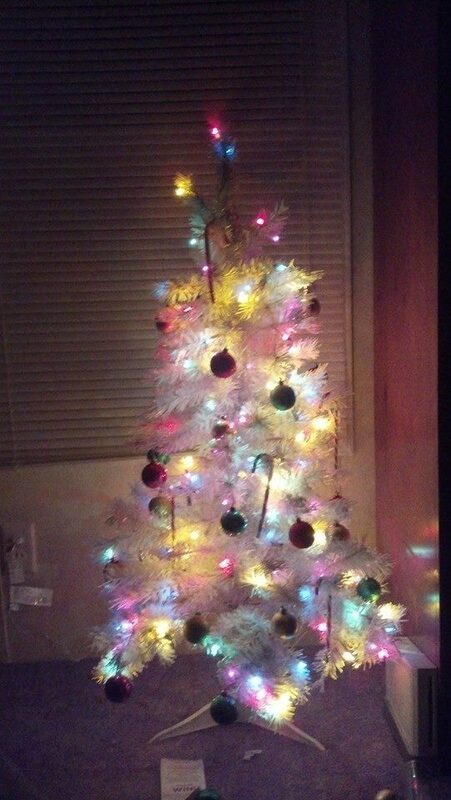 LevelAktveIsRahvin wrote: I bought and decorated my own little christmas tree. I'm going to Seattle for Christmas this year. And you're 18 now, right? Perhaps we can meet up without your mom thinking I'm gonna steal you. I could bring a bucket. I won't be for too long. I'm going to try to leave early so I can spend time with my girlfriend before the end of Christmas break. Today was good too- no school. I'm glad you had a good day Lucario! No school, wooooot! Happy because snow. Annoyed because essays. The tree is halfway done, we ran short on the lights by one strand, so once we get that one up we can put bulbs on. It's gonna be good. Status update: all the feels from the christmas theme.